Product #16142 | SKU UH7000 | 0.0 (no ratings yet) Thanks for your rating! The UH-7000 is a pro-level microphone preamp and audio interface, designed with a strong focus on low noise and high audio quality. 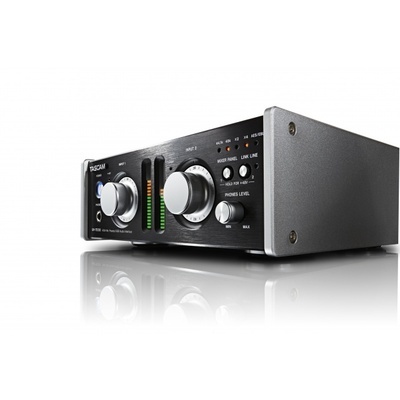 Not only can this unit be used as a 4-in/4-out audio interface in a DAW production environment, but as a standalone microphone preamp and AD/DA converter. The built-in HDIA (High Definition Instrumentation Architecture) microphone preamps are newly designed with low noise and high audio quality. These impressive mic pres perform at -128dBu EIN, a 117dB signal-to-noise ratio and distortion ratio of 0.0009% or less. The grand nature of the UH-7000's sound is partially due to the careful attention spent on selecting parts. In addition to the Burr-Brown PCM4220 ADC, PCM1795 DAC converters and thin film metal resistors, installed is a powerful TCXO clock generator with +/-1ppm precision. The analog audio input circuit was designed to achieve low noise and high audio quality throughout the entire signal. Key parts only made the cut after many intense listening tests. Everything from the film capacitors for improved noise performance to the thin film metal resistors and others. Audio equipment generates a small amount of voltage even when all input/outputs are disconnected. This noise is calculated as equivalent input sound pressure, most commonly known as equivalent input noise (EIN). Signals at levels lower than this value are masked. -128 dBu represents the smallest signal level the UH-7000 can actually handle. Signal-to-noise (S/N) ratio: 117 dB (mic to AD converter) The signal-to-noise (S/N) ratio is a logarithmic value that expresses the amount of noise in comparison to the signal. As a value that indicates the performance of audio equipment, it is extremely important. As this value increases, the amount of noise decreases. With no distortion being the ideal, this value expresses the distortion (harmonic content) from the circuit. As this value decreases, the amount of distortion also decreases. Most other USB audio interfaces cannot reach THD levels this low. The UH-7000 is fronted with large aluminum input level knobs The smooth-tension knobs of the UH-7000 support extremely fine adjustments. The unit also includes independent 20-segment LED level meters. In combination with the large knobs, recording levels can be adjusted even more precisely. The internal circuitry is furnished with Burr-Brown's impeccably pure PCM4220 AD converter. This converter uses a high performance chip that was developed specifically for professional audio and boasts a dynamic range of 123 dB (-60dB input, A-weighted) in isolation. Audio signals digitized by the PCM4220 can be sent via USB to the computer or output from the XLR AES/EBU digital output jacks. For digital-to-analog conversion, the UH-7000 uses the equally impressive Burr-Brown PCM1795. The digital inputs and outputs support transmission in IEC60958-4 (AES/EBU) and IEC60958-3 (S/PDIF) formats. Even when used in standalone micrpre mode, the output signal runs through the internal digital circuit. Link line function enables volume control of powered monitors The link line function allows the line output volume to be adjusted using the headphones volume knob. This allows users to connect the unit directly to powered speakers and adjust the monitoring volume without need for a mixer or other equipment.